Published: March 12, 2013 at 02:05 p.m. Updated: March 16, 2013 at 03:49 a.m.
Notes: General managers might disagree with plenty of these selections, and the debate begins here at No. 1. I have Wallace at the top of the heap. His field speed can take the top off a defense. That's his bread and butter -- and he'll be bringing that talent to the Miami Dolphins. NFL.com's Jeff Darlington reported Tuesday that Wallace has agreed to a contract with the Dolphins. NFL.com's Albert Breer reported specifics of Wallace's $60 million deal. The wideout will recieve $27 million guaranteed upon signing and another $3 million at the start of the 2014 league year. The contract nets Wallace $37 million over the first three years. Wallace must pass a physical before the deal can become official, NFL.com's Aditi Kinkhabwala reported. On Welker: It's almost impossible to imagine him outside New England, but that's the case. With five 100-plus catch seasons since 2007, Welker is a hyper-productive weapon that -- in the right system (and that's a must) -- can be a quarterback's best friend. Breer first reported Wednesday that Welker agreed to terms on a two-year, $12 million contract with the Denver Broncos. A source close to the situation later told NFL Network's Michelle Beisner that Welker will receive a $4 million bonus and a $2 million salary in 2013 and a $3 million bonus and a $3 million salary in 2014. The Packers now are likely to look for a wideout in the draft. Jennings does everything well and brings locker-room leadership. Notes: A source told NFL.com's Ian Rapoport that the Pats reached a five-year, $31 million contract agreement with Amendola. The deal includes $10 million guaranteed. Amendola had 12 more catches than the second-best wideout in St. Louis, despite missing five games. His hands are outstanding and he represents a slot upgrade for 85 percent of the league, but, again -- can he stay healthy? Notes: Edelman is an athletic, dangerous player in open space. He's grown as a return man and Bill Belichick has continued his receiver-turned-defensive-back tradition with Edelman in recent years. His production isn't guaranteed in another setting and it's likely the Patriots bring him back. ... Avery dropped an NFL-worst 12 of 72 catchable passes last season and managed just 12 yards in the team's wild-card loss. His 60 catches for 781 yards in 14 starts included just two 100-yard games. His production sputtered down the stretch, but that didn't stop the Colts from re-signing him. Notes: Projects galore. Moss won't be back in San Francisco. ... The Bills, meanwhile, won't re-sign Jones or Nelson, meaning Buffalo might wind up plucking someone else off this list. ... Stokley did a nice job in Denver, but turns 37 in June. ... Cribbs would be an intriguing fit for the 49ers and whispers suggest there's interest there. ... Collie is an enigma. He could help anyone if healthy, but who's going to put energy into a player who can't stay on the field? ... Simpson played himself out of a job in Minnesota. ... Edwards is a shadow of what he once was, and Henderson's occasional production as a deep threat is diminished by too much inconsistency. ... Massaquoi's durability was frustrating in Cleveland. The top-tier wideouts are going to be expensive for a reason. In a league leaning heavily on the pass, a receiver like Wallace or Jennings can inject life into an offense. You still see too many overpaid wideouts vanish in the wrong scheme. Beyond Welker at No. 3, you're looking at role players. The March buzz surrounding this group will give way to the truth in September: Most are available for a reason. This year's draft class is a factor. Plenty of young, developmental pass-catchers will be available out of college and that's a better option than overpaying for a reclamation project. Buffalo Bills: With Jones and Nelson on the outs, the Bills need to restock. Carolina Panthers: Steve Smith isn't getting younger and there's nothing across from him. Dallas Cowboys: Dez Bryant grew up last season, but Tony Romo could use another big target. Detroit Lions: Complementing Megatron would be ideal. Houston Texans: This offense needs a pass-catching playmaker to pair with Andre Johnson. 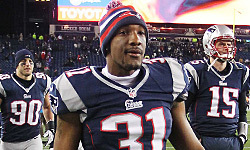 New England Patriots: Welker is gone, and Brandon Lloyd and Edelman are up in the air.